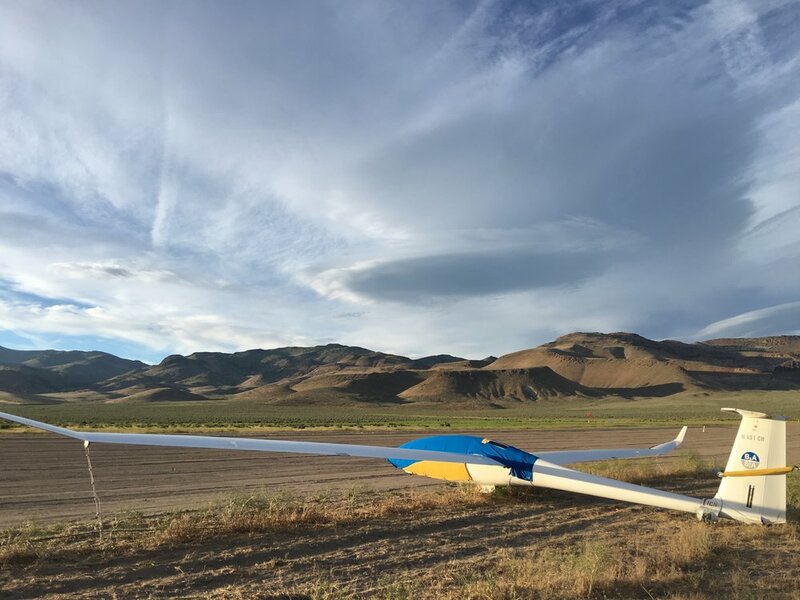 BASA owns several high-performance sailplanes, which we rotate between Hollister and Truckee throughout the year. All ships are equipped with radios, transponders, oxygen, and electric variometers. N451CH is a modern, high-performance, two-seat sailplane with 18 meter and 20 meter wing tips. It is surprisingly easy to fly, making it a good trainer as well. It is ideal for cross-country, wave, and competition. N505KM is another DG ship that is quite similar to N451CH. It is also quite versatile and easy to fly. It has 20 meter and 18 meter wing tips, which allow both high-performance and aerobatic flying! N106DS is a Club Class "Junior" with 15 meter wing span. It is a single-seat trainer, whose light weight at just 520 lb makes its climb performance hard to beat! Fixed landing gear and lack of ballast also make this a very simple craft to fly. N9094D is a Standard Class Discus (manufactured in Czech Republic) with 15 meter wing span and no flaps. It offers 42:1 glide performance, good thermaling performance and a comfortable cockpit.